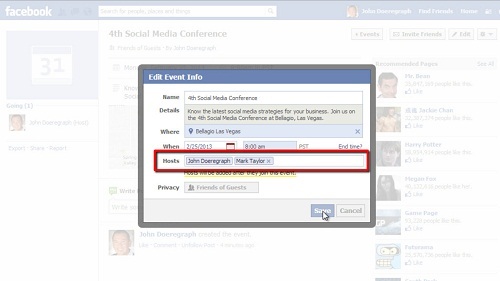 In this tutorial, you will learn how to make someone a Facebook event admin. Recently, Facebook has changed its terminology so that instead of using the term “admin” for events, it now uses the term “host.” A host means the same thing as admin used to mean – the host can change the event description, control the event wall, make other people hosts (or “admins”), etc. 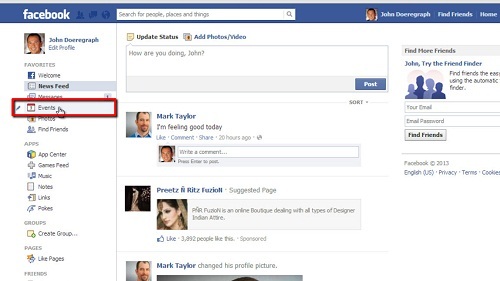 First, go to “www.facebook.com” and make sure you are logged into your Facebook account. You should see a list of items in the left-hand sidebar, including “Favorites,” “Pages,” etc. If you do not see this in the sidebar, click on the “Home” tab in the upper right-hand corner of the screen. Next, click on the “Events” link, then click on the event you want to edit from the list (you should have created your event already). Next, click on the “Edit” button in the upper right-hand corner of the events page, then add whoever you would like to add as an admin (host) where it says “Hosts,” then click “Save.” If the person you added was already invited to and joined the group, they will immediately become a host. If they have not yet joined, they will be sent an invitation and, once accepted, they will become a host. You now know how to make someone a Facebook event admin, which is now called an event host.